The wintry weather had me in the mood for a smooth, indulgent cocktail this past weekend. I was making a big batch of carnitas and wanted a few cocktails before dinner. In light of the carnitas, I found myself leaning to the Mexican coffee liqueur Kahlua and from there it was just a short jump to White Russians. I do like a little bit of Kahlua and cream in my coffee, but by itself Kahlua is too sweet for my tastes. Mix it with cream and vodka, as in a traditional White Russian, and the liqueur is just sublime. I like to mix an ounce of vodka with an ounce and a half of Kahlua followed by cream to taste. I like a darker cream color with a little unmixed Kahlua at the bottom. 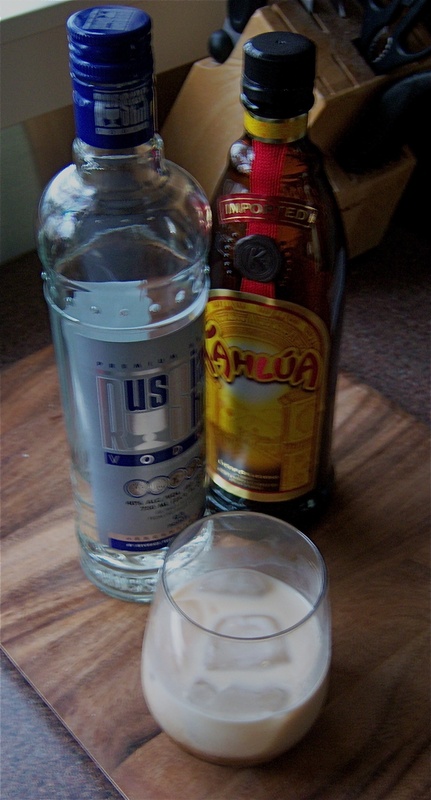 The cream lightens the Kahlua and brings out pleasant chocolate notes while the vodka provides subtle backnotes of clean alcohol flavors to remind you that it’s not a melted milkshake you’re drinking. The combination does work, although Half and Half or heavy cream is better in a cocktail than milk. Be warned though, the Kahlua and cream masks the fact you’re having a two to three ounce drink and the sugary sweetness of a White Russian can make you down them very fast. Remember, The Dude abides. ← Previous Post The best bar in San Francisco and … the world?